This low cost premium controller is ideal for HVAC and industrial control applications. Control virtually any terminal unit application such as: Rooftop Units, Fan Coil Units, Heat Pumps, Unit Ventilators, Air Handlers, and Plant Control. Add I/O expansion modules and control highly complex custom HVAC units or high point count heating and cooling plants. Battery backed real-time clock with on-board scheduling and trend logging. The SCC-520 also includes support for Modbus RTU at no additional cost. Use Modbus RTU to integrate with third-party utility meter data, network sensors, and a variety of other useful remote device data. Modbus data can be used in Catalyst programs and shared with other BACnet devices as needed. 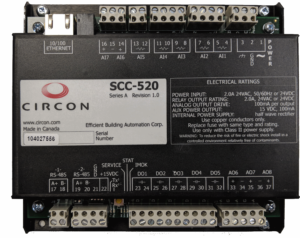 The SCC-520 is easily configured and programmed using Circon BACnet Integrator and Catalyst graphical programming tools. These Windows based tools are available at no cost to EBAC clients and partners, and include a comprehensive sample program library to provide a quick and easy start with the SCC-520. Click here to view the SCC-520 datasheet, or contact EBAC today to learn more about this and other product and service solutions. ©2019 Efficient Building Automation Corp.